Fiona Bruce and the team pay a return visit to Hever Castle, where finds include a medal given to one of the crew of the Carpathia who helped rescue Titanic survivors. Browse content similar to Hever Castle 2. Check below for episodes and series from the same categories and more! Like any antique, a castle needs a bit of care. If it's not looked after, it can fall apart. By the late 19th century, this place had become something of a ruin. Its noble residents were long gone, tenant farmers were using the ground floor for livestock. Thankfully though, it had a knight in shining armour who restored it to its former glory. All of which means we can return for a second helping of the Antiques Roadshow from Hever Castle in Kent. This is William Waldorf Astor, Hever's rather unlikely hero. but after a spectacular falling out with his aunt, he declared, "America is no place for a gentleman,"
and decided to move to England in search of the life of an English gent. Hever Castle in 1903 and resolved to restore it to its former glory. And you can see the results here in his study. he transformed it into a place more decorated and elaborate than it had ever been in its heyday. for a millionaire like him, who liked to hold huge parties. servants' quarters, kitchens, 100 rooms in total. And Astor's grand plans also transformed Hever's grounds. The sheer scale of it all is incredible. but it actually took 800 men to dig it over two years. and a special train had to be laid on to bring them here from London. the crowds, as the people of Kent bring their antiques to today's Roadshow. because when it comes to Lenci pottery, they are the masters. No. It belongs to my sister-in-law. -She couldn't be here, so she asked me to bring it. And all I know is that she inherited it from her grandfather. Ah, well let's have a look at it, because it is, of course, Don Quixote on his donkey, Rocinante. I've been practising that... Rocinante! is the name and you can just make out... and it's dated as well, isn't it? Can you read that date for me? is that they did incredibly stylish figures, and as I say, they're always incorporating humour. But in this case you've got a figure that's suffered a little bit with the ravages of time. For a start off his lance has been substituted by a rather handy knitting needle, OK? -And I have to say that the Don has lost his head, because he's been glued back on. But the good news is that your Lenci collectors are very tolerant about damage. Italian masterpiece and you're going to have tell her what it's worth. the damage has reduced its value to between £2,000 and £3,000. I think she's going to be very happy with that. "When this you see, remember me." -Can you remember how you got hold of it? freshly-dug earth and I thought it was the top of a bottle, picked it up, and it was this ring. My goodness, what were you doing near a badger hole? I've got some near where I live so it was quite close by to my house. Yeah, well how exciting, I mean busy little badger obviously and to find this is really quite exciting. black enamelwork on it, which I'm sure you must have noticed, just underneath here. it really would get worn away! that you've got here, there's also hair, plaited hair, underneath. Oh, is it? Gosh, I did wonder. have been the initials of the person who was being remembered, or maybe even the person who it belonged to. so unfortunately there was all this big fashion for memorial jewellery, basically. Was this given to someone while they were still alive? -and it was there for them to remember that one day they're going to die. decoration, but this is more of a straightforward piece with just the initials. So is it something that you've actually shown to a museum? -No, I haven't, no, no. it didn't belong and didn't come down through your family, and so is it therefore technically yours to keep? -Well, it was on my property. -So does that make a difference? or whether it comes under what is commonly known as "treasure trove". but hopefully they will release it back to you and then you can do with it whatever you wanted to. it's more of an interesting factual piece of jewellery, in many ways. and will fetch somewhere between £800 and £1,200. Wow! Gosh, that's amazing. Well, thank you very much for that. we obviously have a great naval tradition of wonderful ships. and ships and all it represents. a battleship of the late 19th century, an astonishing model. It's amazing to see such detail. Most of these models were made by shipyards. but I detect that this is somehow different. Is that right? I think so, in that it was made by my great-grandfather in about 1905. The ship itself floundered and was torpedoed in 1915.
not only made the ship, he made the steam turbines inside as well. Actually, proportionately, it's slightly odd. I suspect it was a little more stable this way. So this is a working model. So this is him, of course. -he made various models, this being one of the most important. -Do we know why he picked this one? No, and again, I suspect that there were lots of patriotic magazines of those days. that you could build out of metal and wood, which this ultimately is. This is a class of ship that was built from the 1880s into the '90s. because it has echoes of certain liners of that period. These Olympics, Titanics, these great words are reflective of the quality of the ship. We could spend hours talking at detail because everything works. It's a working model. What I want to see is the machinery. -Can we get into that? -Indeed. It takes three movements. We have to remove two funnels. ..and you can reveal the detail that took place. We've got the boiler and we've got the power plant itself. Of course we've got to remember this is where he started. around that and this is why he's changed the shape slightly. so you've got your methylated spirit tank there. of the steamer that worked. a wonderful model of a great ship of the line of that period. he's adapted the shape a bit, which is fair enough. that was actually on the ship, and it works. I suppose this is a £10,000 model. It could be more. It's such a splendid thing and it's such a one-off. from Beijing in China and they all work in television in China. And you make a programme that is like the Antiques Roadshow in China, is that right? -Yes, we've got an antique shul. Antiques shul. Even I could manage that. which is not real, that you smash it, you break it. Is that right? "If it's a real one, very good one you'll have a big surprise." -"Are you willing to go to that?" or just break it, they just don't know which way it will go. No, they don't know, so it's a big surprise to the audience. -Yes, well to the person who owns it, presumably. I don't think we're quite ready for that, do you? -But how fascinating to hear that. Thank you very much. When I was young, I adored Isadora Duncan. and you have the most marvellous collection of Anna Pavlova memorabilia. Tell me about it. so I have hundreds of photographs and programmes, all sorts of things. One of the things she bought was this table when Ivy House had to be sold, when Pavlova died. -And Ivy House was where she lived in Hampstead, Golders Green. She had tea parties in there apparently, with her friends. So Anna Pavlova, born near St Petersburg in Russia, 1881. A great mystery surrounds her father. became a prima ballerina in 1906 with the Russian Imperial Ballet, Ballets Russes. that they called them Pavlovatzis, so they followed her everywhere. They were a huge fanbase, yes. but there's nothing like Anna Pavlova. because of her superb performance in The Dying Swan. And these were her pet swans. And she obviously had flamingos too. But she was particularly fond of the swans. and then the male died within a month of her. "If I can't dance, I'd rather die." -So she was a true star of her day. And tell me about this. and it's a white feather from the Dying Swan costume. -And we know that, do we? We know it's definitely from...? because she knew her, I don't think she'd put a white feather in a frame for any other reason. Look at this photograph of her. So she was the most fantastic idol of her day. I mean, here we are sitting on her chairs, her table. -telegrams and so it's a very difficult thing to value. -you'd certainly be looking at £5,000, £10,000. Well, what I can say is this is an absolute hybrid. I mean, the arms are turned table legs. "I'll make a bench today." But a pure antique this is not. I feel it must have got a bit of a story. It does actually, yes, yes. where Princess Diana went to school. -Which is just up the road, isn't it? because she won a cup for dancing, and came away with this instead. The dancing cup went for a little more than I could pay. -So you went for a dancing cup. -And what did that make? -So you were the underbidder. I was the mystery bidder and I pulled out at £6,800. And what on Earth made you buy this instead? Well, I just saw it and loved it and thought, "She may have sat on this." -So I just had to have it. -Well, we can only dream. I haven't found the initials DS on it yet but I'm still looking. I hope you didn't pay an awful lot. I think somewhere verging around £150 to £200. -That would sound about right, yes. to talk about your things, but these come from water, don't they? in London and doing surface metal detecting with my dad here. -Some of the items here, the ring was found by my granddad so it comes down a long line. The interest in the history and the other two items are items that myself and my dad found. and these things are found on the banks of the Thames. You wait until the tide goes down and you use a metal detector. and it doesn't have to be anything special, it could be just the smallest of objects. but the key thing is everything gets recorded. It's our heritage and we have to look after it. Lovely. who must have crossed the river at London and lost it then. where the Virgin Mary was venerated because this is her monogram above here. and it shines above everything else, which of course is the Crucifixion. It's central to Catholic liturgy. and these people didn't hope to go to heaven. They had been to heaven. to remind them of the fact that they've nearly gone to heaven. where the Cult of Our Lady was very powerful. How could you ask for anything more magical? It's wonderful stuff. And another loss, and another find, isn't it? and that could be thing that started it all off. with the lead pilgrim badge, but here is nearly pure gold, set with a garnet in the middle. The stones on the other side are glass. They're rather rubbed. and adds colour where colour was rarely seen in medieval society. and the other was through jewellery. maybe 16th or 17th century, probably more likely 16th century. -Have you thought about who the saint is? but I'm not sure. Is it bone or ivory? because it's been lying in the mud. with an image of a saint on it. in art and spirituality and here we have it again. and when you came to a place like this, you brought your own knife. The concept of a fork was probably quite foreign. which you had seen perhaps by venerating a shrine earlier on. and they make you breathless, don't they? And your father. The excitement doesn't change. I've been doing it so many years. its value might be measured in low hundreds of pounds. If you were lucky enough to buy it, maybe £200, £300, £400. Be utterly delighted for me to have that one. And an English Renaissance knife handle, it's up for grabs, isn't it? Is it worth £500, £600? It would be to me. and in my view it must be worth £3,000-£4,000, £5,000, something like that. How could it be worth less? the ring especially, and it's secondary to me. -Did you? Did it drop? You dropped my jaw for different reasons. I don't care about the money. It's so exciting and moving and thank you for bringing it. You really are a very lucky girl, you know. where we have round about 30 guests from Beijing TV station behind you here. Fabulous pair of Chinese porcelain plaques. Despite the rain, they're porcelain, it's fine, they won't get any damage in them. is they are illustrating the process of porcelain production. and a sacred pearl of wisdom. Here we've got a chap wearing the most wonderful spectacles. I think he may be painting a crane or something. We have a bitong, or a brush pot, here. coming out of the kiln. Terrific things. Where did you get them? visiting their home, they were always on the wall, and I inherited them. -And I know nothing else about them. -What about you? Did you say, "I want those plaques?" I did like them and admire them every time I visited. The detail in them, the colours, the images...just fabulous. was first made during the reign of the Emperor Kangxi. He reigned 1662 to 1722. But styles and techniques were copied, so these actually don't date from the Kangxi period. They date from the 19th century. But they are so beautifully done. What's also interesting about them is all this calligraphy on them. but I guess these are describing what's going on. Would you be kind enough to see if you can help us with these pieces? -We start with this one up here. -It means a place to paint those products. -Painting the bottle. And this one here? I think that means the guy who is taking charge of this place. -Um... Here it means kiln. -this one, take this one, take the bottle. they take these away and to the market, maybe. -So it's the narrative of what's going on in the scenes. I think they're really interesting, lovely things. -Very, very nice indeed, and thank you for that. Presumably you brought them here because you want an idea of what they're worth. It was more about why they were made and the description, the narrative. They're made, really, to be decorative plaques. They may have fitted inside a table screen. or sometimes they're just framed as decorative objects. they would be very much more valuable than they are. -In a Chinese auction, I think these would fetch at least £10,000. 120,000 Yuan, but terrific things, really nice things to see. Xie xie and thank you. from my godmother, who was my mother's eldest sister. the bunks and the accommodation for the survivors of the Titanic. -saying that the Titanic was in distress. obviously steamed, as you would, to the aid of the Titanic. to get there as quickly as he could. To get as much speed as they could out of the Carpathia. and the Carpathia and its crew saved over 700 souls from the Titanic. who was pulling those people from the water. He definitely was, yes, yes. silver medal for officers and a gold medal for the captain. -I think there were two or three gold medals actually. -about how many gold medals were issued. We're fairly certain about the silver medals. you can see it's a lovely, detailed medal. "from the survivors, SS 'Titanic'." how can I say, very, very proud to have this in the family. I don't believe or accept that it actually belongs to me. and it will continue to go through the eldest of each generation. -You're the custodian for a while. if this were to come to auction, this would make £7,000 to £10,000. Mm, doesn't surprise me, to be honest. -because it will never leave your family. and the majority I've bought very, very cheaply. it belongs to my brother, he asked me to bring it along. -He bought that for 50p at a car-boot sale. -OK, and what about the rest? The chap had had it on his stall for months. and I bought it for £2.50. so you've got great stuff that's cost nothing. and they're just terrific examples of extremely rare things. dating 1725, so that's almost 300 years old. -and I've never handled one until this came into my hands. So that's just sheer delight, wonderful to see. you know, really good values. and is worth, maybe £300. and that's 300, that's a 300-quid glass. I paid £15 for that. show you a profit, man, don't you fret. that passed for wine of the period. is this little baby, which is clearly the pretty one. this is a really early 1720-1730 characteristic, right? It's a white wine glass, so we have the slightly pinched-in bowl. as egg-shaped mead glasses for champagne. So the dome suggests to me 1730. -whether this is a Victorian copy. But if this is right, this 50p glass is £1,000. My brother will be very pleased. It's a bit of a wreck. -How long has it been like this? And why did you bring it? I was going to throw it away and I thought I'd just bring it down. Let's just see what's happened to it. Oh, my goodness, that is a real disaster, isn't it? to rivet the whole thing together again. I mean, the whole thing is heaving, I can sort of feel it. Dear oh, dear. OK, well, tell me the story behind it. Well, it was my granddad's and it was on his bedroom wall at the head of his bed and it was always there. And was he a religious man? and an incredibly elaborate border. Now do you know your baroque from your rococo? It's very grand, very symmetrical, but it's very swirly and whirly. it's shifted, and lots of scrolls and shells enter, so you've got a mixture here. -so I reckon that this is on the cusp of one moving to the other. And that will take us to 1730-1740.
or making a prayer, this comes in useful for making your prayers. picking out the shade of little bodies like these with stippling. -and you see the way the faces are done, down there. That's a particular sign of this factory. The question is it worth restoring a very badly damaged 18th-century holy water stoup? To get it restored, you're going to spend £200, I guess. What's it worth when you've done it? for heaven's sake, we're starting on a winning wicket here, aren't we? Tell me about them with you. How long have you had them? What's the story? I think we've had them about 30 years, probably. They belonged to our father and he was given them by a client. I knew he had these two snuffboxes but I'd never ever seen them. It was only when we were clearing out Mum's house that we found them in the loft in a tin box. You'd seen them, but you'd not seen them? and the early 19th century. -and they were objects of great curiosity. And one tended to use them, there was a slight feeling of souvenir quality to them. in a time when travel was very difficult. -and it's from Italy that this one comes. -And it comes from Italy in the mid-18th century. Have you ever thought what it's made of? I think it's made of tortoiseshell. -and it doesn't come from a tortoise. -grips the gold and it seems to grip it like an absolute vice. And it's an astonishing sight. -a tiny whiff of perhaps the Castel Sant'Angelo, which is in Rome. Superb condition, utterly marvellous object, but that's the 18th century. it's asymmetrical, it's wonderful - this is neoclassical. but it's almost jet black. What did you think the technique was? You could easily be forgiven for thinking it was a painting. It's anything but. And the miracle of this one is that it's micro-mosaic. and this is micro-mosaic at its absolutely finest. but the box is actually Swiss. -It has Swiss gold marks inside. -because it's still contained in this utterly pristine box. So 1760 for this. 1820 for this. -when we look at this. perfectly preserved, very enviable, very collectable. is worth £8,000 to £10,000 for this one. And maybe £6,000 to £8,000 for that one. 8,000 to 10,000! And this one was? -6,000 to 8,000, oh, my...! -What else is in the attic? they smash it at the end? I've been thinking... Do you think it might catch on? I don't think it will, actually. Had you going though, didn't I? 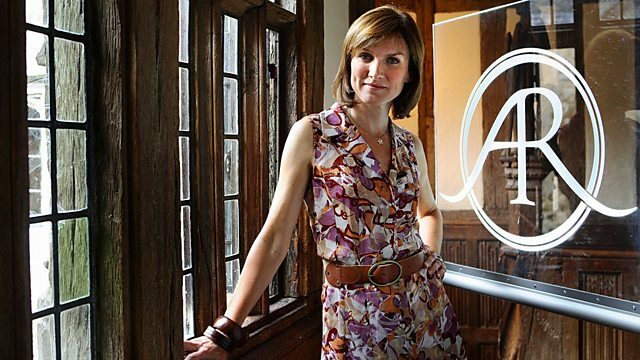 Fiona Bruce and the experts pay a return visit to Hever Castle, where more treasures come under scrutiny. Included in the programme are a medal given to one of the crew of the Carpathia who helped in the rescue of survivors from the Titanic, and reminders of one of the world's greatest dancers with pieces from the collection of Anna Pavlova. Also, Chinese visitors come in handy as two rare Oriental plaques are decoded and given a surprising valuation.